So, after a few days in Tignes, it was straight over to Morzine for the Peanut Butter Rail Jam European Finals! I have done this competition for the last few years, and the finals are always a great day, and it's awesome to see the (very high) level of riding across Europe. Once again, for the third time this week, it was dumping with snow on the day of competition! This didn't matter so much for me, as I was keeping warm hiking and riding, but it meant Nathan was standing in the snow watching for the third time in 5 days! Luckily, Volcom are really awesome at putting on these events, and provided lots of food, drinks and even a BBQ! Here's the Setup: (We went back on a nice day to get photos, the camera had already taken a bit of a beating in the snow this week! So no pictures of me riding unfortunately). Practice went well, I made it through the rails, although it was a bit slow as it was quite a flat run in. In qualifiers I didn't ride quite as well as I had hoped. It is a hard competition, not only because of the level of riding, but also the format. You get a 15 minute heat, where you need to hit all three rails. 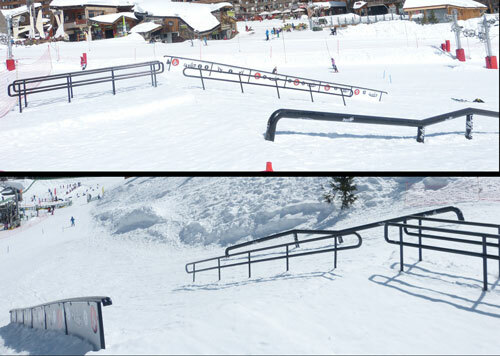 Your best trick on each rail is added together to give your score. It was quite a long, hard hike as the run in was flat they had built a snow mound to drop in off. So, you need to really land your tricks first, if not second time as you don't get many hits. I got OK tricks on the Down Flat Down and Down Rail, and then tried to hit the double rail to down rail....this didn't go so well. I was a bit scared, as it was a metre gap onto the double rail, and then a gap to the down rail, but I knew i'd regret not giving it a go, and only one other girl had hit it, so thought I'd go for it. I managed to slip out of my boardslide and got tangled between the double rail, hitting my shins pretty hard. I had to weave my way out of the rails, shake it off and hike up to get a hit on the lower down rail (missing the double rail this time). But now I am left with a numb shin..I guess that's better than pain! So, I didn't get into the Super Finals on the day, but oh well, I tried! It was fun anyway, and nice to get to ride with Miss Katie Blundell a bit more too (she had qualified in the Laax qualis). We stayed in the freezing cold to watch the Finals and Prize Giving. There were some real bangers! The level of riding in Europe is very high, the Finnish ruled on the day. I think they podiumed in every category! With all the comps done, we stayed on in Morzine for the rest of the week catching up with friends. Both myself and Nathan have done seasons there, so it feels like home! My sister was also out for the week, so I got to spend some time with her too!! Now were back in Austria, Kaltenbach and Mayrhofen are closing now, but we have a month to ride Hintertux glacier, and the park up there should be rad! I'll get some pictures/footage of that!